The last decade has witnessed tremendous advances in the treatment of patients with cancer. Chief among these is the discovery and successful development of new, targeted cancer therapies. These therapies are highly effective in genetically defined subsets of patients, i.e., patients whose tumors harbor specific genetic abnormalities. 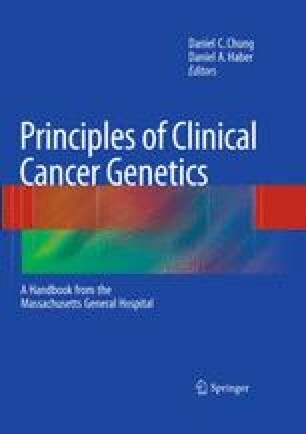 In contrast to previous chapters focusing on germline genetic alterations that increase the risk of cancer, this chapter will examine cancers with somatic genetic alterations that confer sensitivity to molecularly targeted therapies. Examples of targeted therapies include imatinib for chronic myelogenous leukemia and gastrointestinal stromal tumors, traztuzumab and lapatinib for HER2-amplified breast cancer, and erlotinib, a tyrosine kinase inhibitor (TKI) targeting epidermal growth factor receptor (EGFR), for EGFR-mutant nonsmall cell lung cancer (see Table 15.1).